A female aged 70 years, with no previous comorbidities, was referred with suspected heart failure due to mild exertional dyspnoea, mildly elevated brain-natriuretic peptide (BNP) (139 ng/L) and inferolateral T-inversion on ECG. A transthoracic echocardiogram (TTE) showed a moderate global pericardial effusion, mild left ventricular hypertrophy (LVH), moderate aortic stenosis (AS) and preserved systolic function. Serial TTE’s showed a resolving pericardial effusion, moderate left ventricular hypertrophy (LVH) and bi-atrial dilatation, following which cardiac magnetic resonance imaging (CMR) was requested to exclude infiltrative cardiomyopathy. An angiogram was also requested due to suspicion of moderate-to-severe AS, as a work-up for future valve replacement. CMR showed a severely dilated and tortuous right coronary artery (RCA) on Half-Fourier-Acquired Single-shot Turbo spin Echo (HASTE) planning images, draining into an enlarged coronary sinus (figure 1A,B). There was moderate lateral wall hypertrophy on cine images (figure 1C,D), with corresponding oedema (increased native T1 value on T1 mapping, with enhancement on early and late gadolinium imaging). The RCA to coronary sinus fistula was also confirmed on the coronary angiogram (figure 1E,F and Video 1). The lateral wall hypertrophy/oedema was thought to be a direct consequence of the reduced to venous drainage from the lateral wall due to high pressures in the coronary sinus. (A,B) HASTE images from cardiac MRI showing dilated coronary sinus (arrows), (C,D) short-axis cine images showing hypertrophied lateral myocardial wall, (E,F) coronary angiography images showing dilated right coronary artery draining into coronary sinus. Coronary angiography showing a dilated right coronary artery draining into coronary sinus. Coronary artery fistulas are uncommon, often incidental findings on angiography or autopsy, accounting for 0.15% of CT coronary angiography,1 0.1% of cardiac catheterisation2 and 0.002% of the general population.3 The most common site is the RCA (55%), followed by the left anterior descending artery.4 5 They often drain into low-pressure structures such as pulmonary artery, coronary sinus, superior vena cava and right heart chambers.4 Clinical presentation is usually in the third decade, with symptoms of dyspnoea and angina.3 Complications rarely include infective endocarditis, myocardial infarction or rupture. Surgical closure is performed for symptoms or complications. Similar cases have previously been diagnosed on TTE and coronary angiography, with CMR used to confirm diagnosis later.3 6–8 The unique features of this case include the presentation with unexplained pericardial effusion, the diagnosis being made by CMR as well as lateral wall thickening secondary to oedema, thought to be due to reduced venous drainage as a direct consequence of the arteriovenous fistula, leading to increased pressure in the coronary sinus. 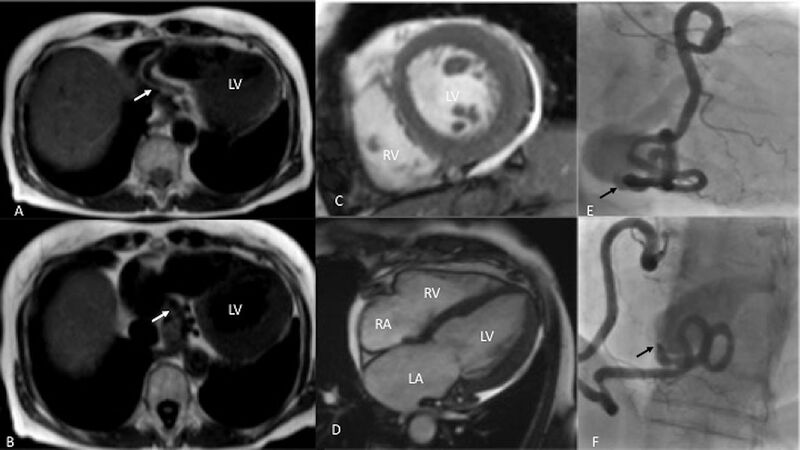 Significance of cardiac MRI (CMR) in diagnosing rare condition such as right coronary sinus fistula. HASTE images in CMR scan are often overlooked, but in this case the plan of management was completely changed based on these images. Right coronary sinus fistula should be in the differential diagnosis of recurrent unexplained pericardial effusion.
. Arteriovenous connection between the aorta and the coronary sinus through a giant fistulous right coronary artery. Hellenic J Cardiol 2008;49:48–51.
. Successful repair of a right coronary artery-coronary sinus fistula with associated left coronary arteriosclerosis. Bol Asoc Med P R 1977;69:156-9. Connections AS. Coronary Arteriovenous Fistulae. 2012;39:1–5. Contributors AMSEKA and AS wrote the case report. GPM supervised the scan and made the diagnosis. All authors approved the final manuscript.